EU countries are sending food and other supplies to the victims of Hurricane Katrina, after the US asked the EU and Nato for emergency help at the weekend. 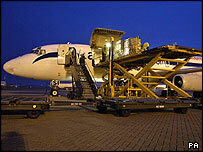 Germany and the UK have already flown in more than 500,000 food rations. France is flying tents, generators and water purifying plants from Martinique, and a Dutch frigate is taking medicine and helicopters to New Orleans. Greece has offered two cruise ships to help house thousands of homeless people for several months. Tiny Luxembourg has 1,000 camp beds and 2,000 blankets at the ready, and Sweden is providing equipment to restore mobile phone networks. According to an EU spokeswoman, a dozen EU countries have responded to Washington's request so far. Romania, which has suffered devastating floods twice this year, is also taking part in the bloc's emergency operation - even though it has not yet joined the EU - by providing two medical teams. EU spokeswoman Barbara Helfferich said European countries had moved quickly to help the Americans - despite a year of natural disasters at home, including severe forest fires in Spain and Portugal, and widespread floods throughout central and eastern Europe. "Emergencies like that - forest fires, floods - happen all the time. We are prepared for it, and I can say that in this particular case we have reacted very speedily. After the aid has been requested, we have basically been able to respond within 24 hours," she said. The aid is co-ordinated by a civil protection centre in the European Commission and by the UK, which currently holds the EU presidency. Meanwhile, Nato has sent a liaison officer to Washington to assess America's needs. The US ambassador to Nato, Victoria Nuland, thanked allies - many of whom are also members of the EU - for what she called the "outpouring of support, both emotional and concrete". The US may not really need baby food from Italy or divers from Belgium, but its call for European and international help shows that, after the divisions over Iraq, it has now realised that even superpowers need friends.